I said it before and didn't stick to it, but this time I think I mean it: I'm done with the M&M series for awhile. I knew going into World of Xeen that I was signing up for a double-header, but it was simultaneously more and less than I was expecting. I mean, it was good; I enjoyed Worlds of Xeen, but something about it didn't quite feel right to me, having finished the first three and developed some expectations from the series. To start, Worlds of Xeen is a combined offering of Might & Magic 4 (Clouds of Xeen) and 5 (Darkside of Xeen). Both games take place on the same world, but on opposite sides and have very little to do with each other; at least in their isolated respective games. Starting Worlds of Xeen places you on "Cloudside", the upper side of the world and the world that is stage of Might & Magic 4. The starting story for this one is more coherent than the last three chapters. You start out with a general idea of your overall goal: your party has been having nightmares about a wizard trapped in a tower and a demon threatening the land and you have to find out more and stop the demon. Yeah, not much to go on at the start, but it's leagues more than you get at the start of Book One! Clouds of Xeen has a pretty structured start. You clear the town of Vertigo of vermin, then are sent to a nearby dungeon that is ten levels deep. Just doing these two things is sufficient to get you to level 10 which is frankly enough to get you moving through most of the game. See, Clouds of Xeen has the unique component thus far in the series of having a level capped not by integer limits or your available gold, but a hard limit of 20. Considering I finished Book Two at 80, and Isles of Terra at 65, a level cap of 20 is tiny, especially when your first play session is enough to get you half way there. I don't know why they chose to do this. After the initial quests, you're more or less turned loose on the world to do whatever you want but this doesn't mean you're free to go anywhere like you were in the first two installments and, to a lesser degree, the third. From a mechanics perspective, Worlds of Xeen is identical to Isles of Terra with a few notable exceptions. First, there's voiced over NPC interactions and cut-scenes. You could tell JVC and New World Computing were proud of these because they're everywhere in Cloudside. Every time you enter a dungeon, an NPC standing guard at the gate gives you a 10-15 second lecture thematic to the dungeon. These are charming, even hilarious, at first but they quickly get tiresome in the latter half of the game. Especially since every "tower" type dungeon in the game has the same cut-scene upon entry, as does each "cave" type. Second, on-tile events no longer trigger when you step on the tile. Instead, there's now an "interact" button you must press to trigger these events; with the exception of traps of course. This is largely an improvement as the signaling that something is interact-able on a given tile is very, very good. So it just means no more silly dances of standing on an event-laden square and every time you turn, menu, etc, the game asks again if you want to interact with it. Finally, the addition of the "day" spells: spells that apply every buff in a given school of magic, but a combined cost. It reduces the menu spam required every time you rest significantly. Clouds of Xeen is rather heavy handed in its sequence of events. Most of the dungeons "Cloudside" are locked, with the key in some prior dungeon or plot point. Yeah, this isn't entirely unlike Terra, where you had a series of locked dungeons that you had to unlock by exploring the prior series of dungeons, but in Clouds it's more linear. World exploration gets you a key to a place that gives you a key to another place that gives you a key to... you get the idea. Most of this gating is done via the main plot point of the game: Newcastle and Mega Credits. In short, you come across a plot of land and an opportunity to buy it. In reality, this unlocks a major component of the game in the form of building your own castle on the land. It's not as awesome as it seems, sadly: you give "Mega Credits" to a clerk of the king and he improves your castle. First improvement is simply flattening the land, second is giving you a keep, and finally you get a dungeon. These represent explorable areas with loot, shops, and the like. Also each time you improve the castle, the workers find a key you can use to unlock a new dungeon. The only source of Mega Credits is dungeons, so if you ignore side-content, you end up in a loop of improving the castle, getting a key, and exploring that dungeon for the next set of credits. Completing the construction of Newcastle opens a dungeon under the castle that is home to the legendary "Xeen Slayer Sword" that is the only weapon capable of defeating the evil Lord Xeen. Obviously this is mandatory. Parallel to this, you have to free the wizard Crodo from Darzog's tower. To do this, you explore a short chain of dungeons to get the key to the tower, then free him. This also opens the way to Castle Xeen in the clouds. You can actually go straight to the dungeon chain to free Crodo, without any of the key and Credit shenanigans but the dungeons will likely be way too hard, and you won't be able to hurt Lord Xeen anyway without the Xeen Slayer Sword. Only finishing both threads gives you all the tools you need to finish the game. Clouds actually ends in a boss fight, which makes it the 2nd game of the series with one. You duel Lord Xeen and his pet at the top of Castle Xeen. Sadly in my case both foes fell in a single blow. My strategy of dumping every martial stat-up on a single Barbarian was just too strong. For the ending I was greeted with a cute cut-scene and an overview of practically every type of enemy I slew. The game force-saves here and drops you back off in Vertigo, with a clue that the other side of the world needs your help. I neglected to mention: the landscape is dotted with pyramids that, if you enter them, warp you to "Darkside", the other side of the world and where Might & Magic 5 takes place. You can freely go to Darkside at any time, but the level scaling is ... very different than Cloudside, so it's probably not a good idea to mix the two. I chose to finish Cloudside first. Looking over my map, notes, and VODs for the "Clouds" half of the play-through, one thing becomes apparent: Clouds was half a game. I explored about half of the world; in fact there's a very clear line across the world that I never explored north of. I wondered if this was because those parts would be visited as part of Darkside, or if I'd just missed a lot of plot threads sending me up there. I'd only really heard one clue that would even push me north: the location of the "Sixth Mirror" somewhere in the lava lands of the north-east. However while storming Castle Xeen I found the mirror in Lord Xeen's chambers, so even that turned out to be a red herring. Also my completion time of Clouds was about half that of the three prior games: 18 hours, while 1, 2, and 3 took 37, 33, and 32 respectively. If I'd chosen to fill out the world map and at least investigate every entrance I found this would probably be extended to 24 hours or so, but that's still significantly shorter. Some of this can be explained by the fact that several dungeons in Clouds can only be accessed as part of Darkside of Xeen. I presume if you only had Clouds of Xeen, they just had locked doors and no content behind them. This means large chunks of the world are just pointless in a Clouds-only, or Clouds-first play-through. I guess this goes back to my "Half a game" assessment. Worlds really should have been one game from the on-set, and balanced that way-- but we'll get more into that in the Darkside portion of this write-up. All in all, Clouds of Xeen just kind of came and went. While every Might & Magic thus far has had this feeling of "I'm exploring the world and then suddenly know what to do and it's half over", Clouds really went deep on this trope. Despite knowing my two major goals all game (free Crodo and build Newcastle), I explored a few dungeons, visited a few towns, did some quests, and suddenly I was looking at the final push before me. In a way I think starting the game with a goal cheapened the experience because I could see the leaps and bounds I was making toward it unfolding before me, rather than it all falling together once I finished the right quests. It wasn't a bad game, but it felt significantly weaker than Terra. I know I keep saying completing a Might & Magic game isn't much once you know how, but this really... isn't much. It's six dungeons, including the final one. There's a few other dungeons that are optional and also serve as an alternative source of Credits, but once you get 15 (conveniently from the first two dungeons here), any more are pointless. In addition you can visit the Witch's Tower, Golem Laboratory, Castle Basenji, the Northern Sphinx, and the Volcano Cave (which is probably too hard for you without Darkside buffs). That's it, compared to the three dozen dungeons in each of the previous chapters. It just feels like Clouds was less of a game over all. EDIT: As traditional, here's the Cloudside map. I phoned this one in. 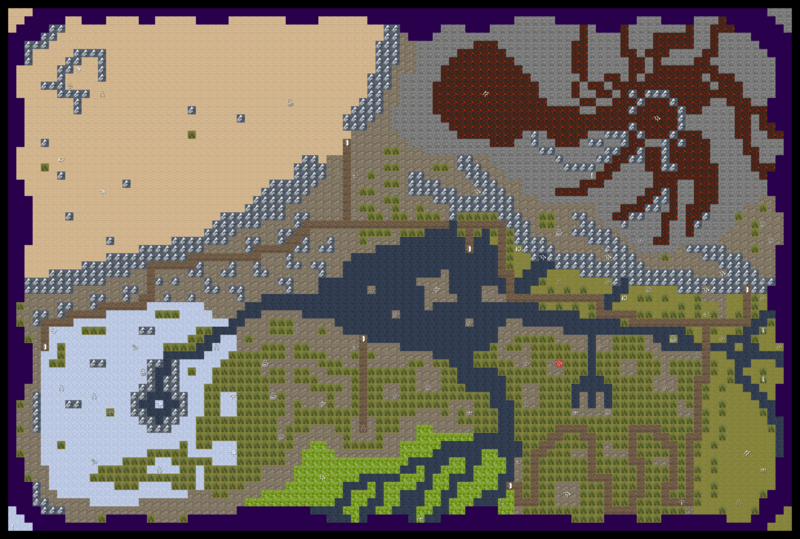 There's just so much flat, aimless land that I eventually just ran through it quickly and mapped only what I saw with Wizard Eye in the north half. As a result I probably missed a lot of stuff.